If a child can’t learn the way we teach, maybe we should teach the way they learn. These wise, enlightened words were said by Ignacio Estrada and are a perfect description for how Mr. Ashenafi Zewedu teaches and impacts his students. Ashenafi might be what you would call a younger, more modern teacher but his modest experience doesn’t take away from his skill or intelligence. Quite an accomplished teacher, Ashenafi has been able to work with children who have struggled to learn and has reached students who seemed unreachable. A large part of Ashenafi’s success comes from being so diverse. He is willing to do what it takes, to help students learn and this means trying new and different approaches. Ashenafi’s students speak highly of him and his various techniques, which include using objects and images while teaching, color coordinating notes, positive feedback, challenges and rewards, one on one teaching, humor and kindness. The students aren’t the only ones who think highly of Ashenafi. Other teachers and parents have also recognized him for his kindness and approachability with the students, for his clear instruction, his ability to use different approaches and his open communication with parents. Ashenafi doesn’t see himself as a superior teacher, although many may consider him to be. He is just a father and husband, doing his best to help his students grow up to be creative, effective, disciplined and successful. He wants to help make his country a better place and to play a role in helping it develop. All of Ashenafi’s efforts and labors to help his students and help his school are pure in motive, as evidenced by his financial struggle. Ashenafi could take a higher paying teaching position at one of the private schools in Debre Zeyit. This would give him more income to provide for his wife, two children, parents and siblings that all live with him. The downside is that Ashenafi would no longer be able to impact the younger generation of poor, impoverished children in need of direction and guidance. We appreciate Ashenafi and his selfless heart for the children of Debre Zeyit. He is a huge asset to the BCI Academy and we want to reward him for his faithfulness with a small stipend of $45/mo. This stipend will be a huge blessing to him and his family and show him how much he is appreciated! Can you help with this? Do you know someone who can help with this? Head on over to our donate page to make a contribution today! Blessing the Children has been working with the Ethiopian Government’s Social Services – an organization called the Ministry of Women’s and Children’s Affairs. Working alongside this government organization, they help us to identify the women and children who have the greatest need so that we can provide support to them. Through our years of work with the Ministry of Women’s and Children’s Affairs, they have seen our work, our heart, and the impact that we have. In response to this, they invited us to be part of an evaluation of the local NGO’s of similar size and outreach working in Ethiopia. This evaluation looked at four areas of each organization: financials and reporting, administrative cost, meeting objectives, and use of resources. After agreeing to participate in this assessment and giving the Ethiopian Government everything they required, Blessing the Children was elated to be ranked #1! Not only does this top rating come with the title of being #1 but the government also rewarded Blessing the Children with a used Toyota Land Cruiser. This reward will go a long way towards saving money on transportation, especially when taking our kids to appointments and checkups! We are so honored and proud to be able to do the work we do in Ethiopia and none of it would be possible without your support! Thank you to everyone who has supported us and who continues to support us – you are making this possible! If you would like to sponsor a child or make a donation, please visit our donate page today! Do you remember a special teacher that made learning fun and brought the subjects to life? Mesfin Tulu is just such a teacher. You will never see kids more interested in Math, then when Mesfin is teaching them. With his kindness, confidence, and competence Mesfin is easily one of the top teachers at the BCI Academy, loved by students, parents and other faculty alike. Mesfin is 30 year olds and holds a bachelor’s degree. He has a love of learning and teaching and he credits this to his own experience with a great, life-changing teacher, Mr. Gashaw. Mesfin’s classes with Mr. Gashaw were so life inspiring that he decided he wanted to be a teacher and encourage children like Mr. Gashaw encouraged him. Since joining the BCI Academy last year, Mesfin has proven himself to be a skilled teacher who not only brings his knowledge of the subject matter but his kindness and heart for children to the BCI Academy. Mesfin loves what he does and it shows every day in his joyous attitude and interaction with his students, but this doesn’t mean his job comes without struggles. Mesfin and his students after class. 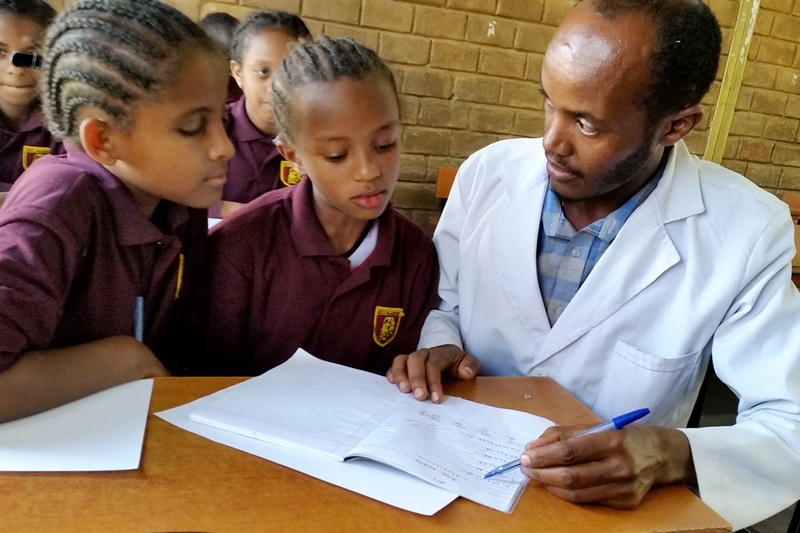 Because of Mesfin’s compassion and heart for his students, he finds his greatest challenge to be finding a balance in working with students who have no help at home. He wants to divide his attention equally but his heart is torn by the children who need that extra support in the classroom. Another challenge he faces is getting by on the income of an Ethiopian teacher. The average income of a teacher in Ethiopia is around $100 USD per month. Yes, you read that right. $100 USD. The average cost to rent a house/apartment is $60 USD per month and this is just a small, one-bedroom home. Nothing extravagant. It doesn’t leave much left to live on when 60% of your income goes towards simply keeping a roof over your head. Because of Mesfin’s skill, passion and now, experience, he could take a position at a private school and make a slightly higher wage. This would allow him to live more comfortably but would not give him the opportunity to work with poor, underprivileged children. Mesfin giving some students one on one help. We greatly appreciate Mesfin and his heart and would like to reward his altruistic selflessness by subsidizing his salary with a stipend of $45/mo. This may not sound like a lot but for Mesfin, this will be a huge blessing and ease some of his financial struggles. If you are a teacher, if you know a teacher or if you have children in school, you can attest to how hard working and generous teachers are. You know that they most certainly don’t do it for the money, but for the children. If we can make life a little easier for Mesfin, what a blessing that would be! Would you consider supporting Mesfin, as he continues to give his all for the children at the BCI Academy? If you are unable to commit to a monetary donation, would you share this need? Start your monthly donation today!